Volcano1 [Todd] 420 g Mixed Beauty. I am honored to be asked by ChicagoReefs to share my tank with you. I'm stuck out in the boonies, but have had the luck to be close enough to the Chicago area, in order to have a great resource for my hobby. 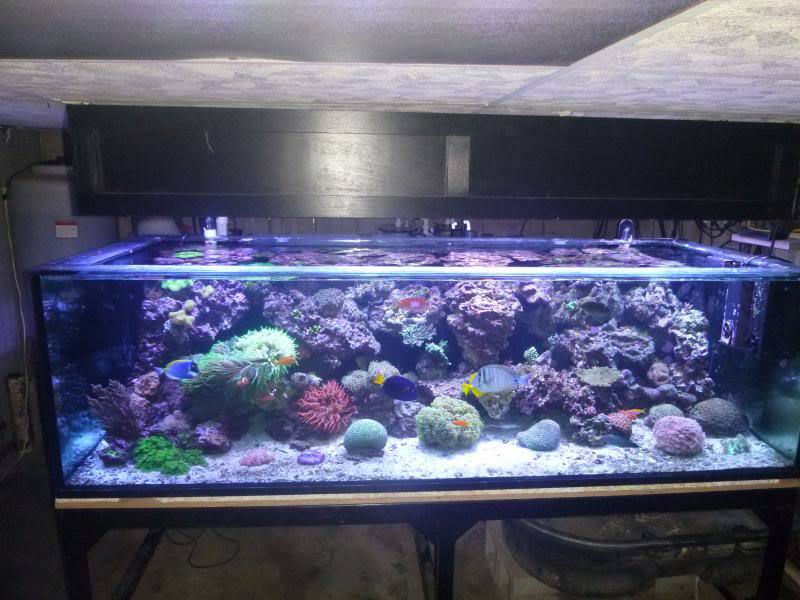 I think the Chicago based Reefers are a great bunch and have made reefing much enjoyable. I've only been able to meet a handful in person over the years, but all have been very positive. I've always liked aquariums, some people around me back in the 70's had small freshwater tanks. As I got older I was exposed to my first Reef tank, in the mid 80's. 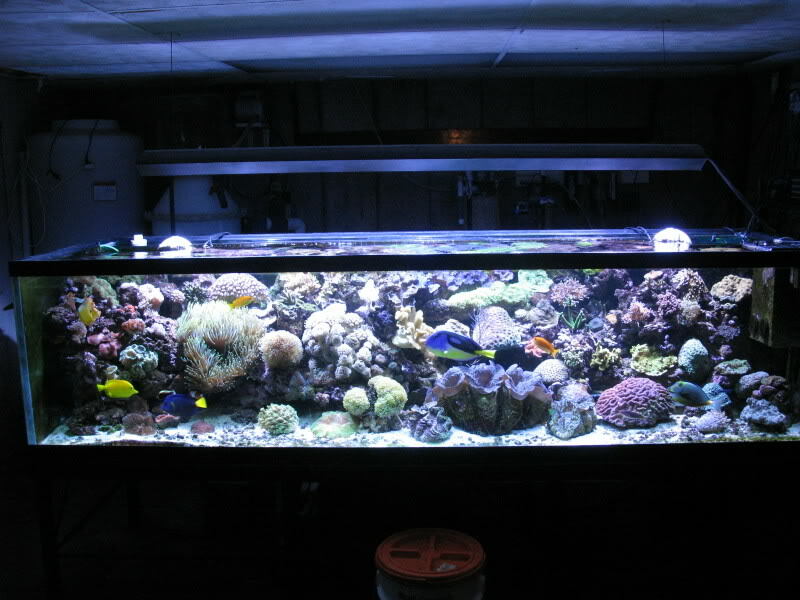 It was nothing as special as the reef tanks of today, mainly softies and LPS. I did like the mix of colorful fish, much more interesting than the previous fresh water systems I was used to. I set up my first venture into fish keeping during this time. I started with a goldfish/Koi pond. As the winter grew near, I found a large tank, 300 gallons. My thought was to house my pond fish for the winter. I however found a love for Cichlids from several LFS and that tank was used to house them, the pond fish went into a kiddie pool. I kept Cichlids for several years, mainly Africans, with some other tanks mates. 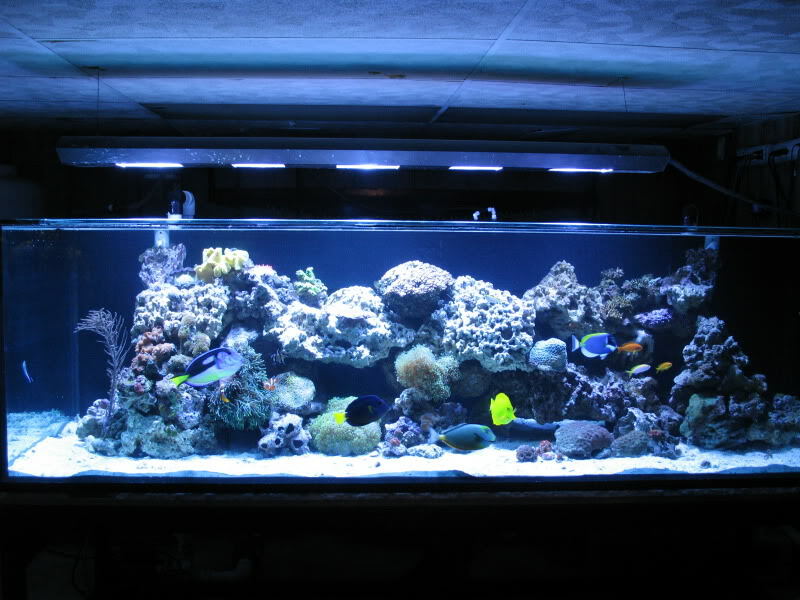 In the Late 90's I decided to try my first reef tank. 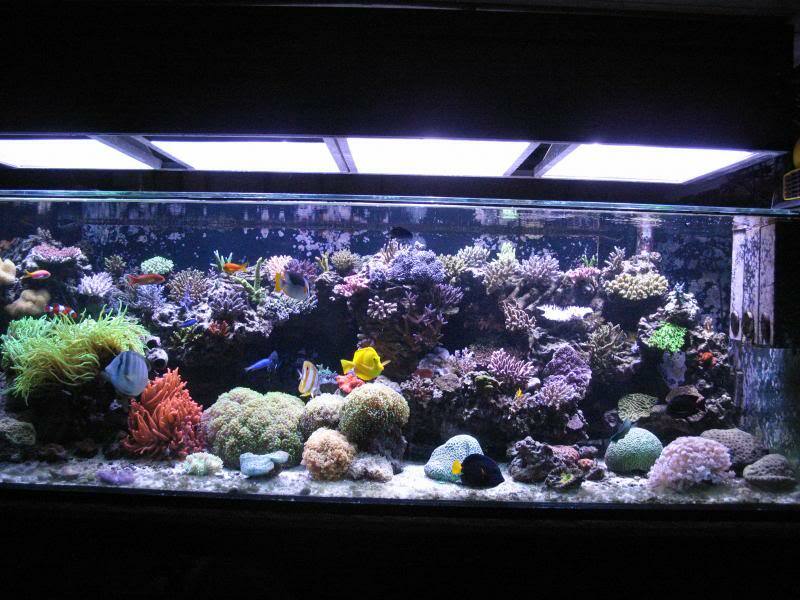 It was a 90 gallon tank; with mainly softies, star polyps, xenia etc. I converted the freshwater tank into the reef and moved my collection there. I expanded it over the years to include mainly LPS and Softies. It continued this way until, 2005. I started with adding easier SPS, Montis, Pocillopora and clams. It continued on this path, eventually making a sps dominant system around 2010. At this time I upgraded tanks, to the current 420 gallon. I have had many ups and downs, with several major tank crashes. The worst, in 2014, were I lost 90% of my SPS and 40% of my other livestock. I still have some of the corals and fish from the first stocking, but not many. I've sworn to go FOWLR if I have another crash, but haven't been able to give up the addiction yet. The current tank was set up with two goals in mind. It was going to be a dominant sps tank and I wanted to have a lot of swimming and hiding places for fish. The rockwork is raised up off the bottom of the tank about 5". I used mainly Tonga shelf and branch as the base. It is supported by 4" pvc pipe under the rockwork. I also wanted room behind the rockwork for swimming space and circulation. I added a coast to coast external overflow and an internal weir, approx 5' long to the back of the tank. The rock work is about 6" away from the back glass. It rests against the internal weir of the overflow. I tried to use as large as liverock as possible, with several being watermelon size or larger. Most of this was Marco rock, seeded with liverock I had already had. I also tried to create as many holes, caves and overhangs in the rock as possible. I wanted to have flow go in, out, under and around the rock to prevent any dead spots. I only use MH lighting, with no supplementation. Lighting schedule is 2 MH on at 11 am, 4 on at 11:30am - 8:00 p.m., 2 MH on 8:00-8:30. The tank uses a skimmer and biological filtration. It has a minimum of 300 lbs of liverock. The tank is connected to 2 - 100gallon rubbermaid stock tanks both filled with liverock and coral rubble. They serve as sumps, fuges and cyrpic zones. An ARID C-30 cheato reactor was also recently added, it’s feed from the first sump using an 1262 pump. It’s lighting is reverse daylight for 11 hours. I run carbon in a BRS jumbo reactor and change it every 2-3 weeks. The skimmer is a Volcano 1864 skimmer with an 18" reaction chamber, its 64" tall, has a Dart needle wheel impeller force feed by an Alita 40 air pump and a Reeflo snapper feed pump. Feeding is done 2-3 times a day with a mix of New Life Spectrum large and small pellets, freeze dried krill, and a mix of frozen foods, varied throughout the week. These include Rod's original, herbivore and predator foods, Larry’s reef frenzy, Rods krill plus, and PE mysis shrimp. Dried nori is also given several times a week. The system uses only kalkwasser and water changes for supplementation. A reefiller dosing pump drips kalkwasser and RO-DI water, from 2 separate 65 gallon HDPE drums to match alk and evaporation rate. I have started iron dosing for the cheato reactor only. Water changes are done 10% every two weeks with RC salt mix, from a 65 gallon HDPE mixing station. RO-DI water is made with a 6 stage 180 gpd Spectrapure system with booster pump. The system is controlled by an Aquatronica Touch controller, 4 power bars, ph and salinity probes. Flow is provided by 3 Tunze wavebox, 3 tunze 6105's, 1 tunze 6200, and 1 tunze 6100. The 6100 ,6200 run behind the rock work , near the bottom of the tank, on opposite ends facing each other. The return pump is a Reeflo Dart. There are two returns behind the rockwork, under the internal weir. They face towards each other. The remaining Tunzes are located one in each rear corner, flowing along the top of the rock work towards the center of the tank. The one remaining tunze is located next to the waveboxes, at the top of the tank, directed towards the middle. I get a flow all around the rock work, in a clockwise motion, along with flow across the top of the tank and random flow through the rock work from behind. Tunzes are controlled by Tunze 7095 muli controller, night mode with interval 2. There are approximately 40 sps colonies, some of which I don't have an I.D. for and 15 LPS colonies. One large GBTA and a few assorted others.